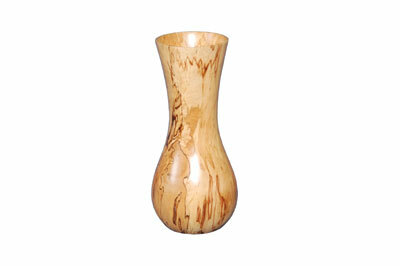 Spalted beech vase, 305mm (12in) high x 140mm (5 1/2in) dia. 1. Can you explain, briefly, the type of turning work you carry out at present? Turned and shaped woodwork for industry, such as architects, furniture makers, boat builders, cabinet makers and fibre glass moulders, to name a few. 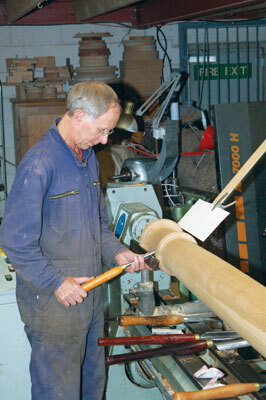 Large columns, split turnings, segment and faceplate work, twisting and fluting and artist commissions. 2. What is the most unusual commission you have ever received? This would have to be a turned split pattern and two 'stepped joint' core boxes for a local foundry. I was given a bronze casting off an 'air winch' from a ship docked in Fremantle, which I was told was was urgent. I had no drawings to work from so this was a bit of a challenge. I worked back from the casting, making working drawings with shrinkage allowance for moulding and machining. The knowledge and pleasures of training as an engineer's patternmaker. It's good to see youngsters (boys and girls) becoming involved, thanks to the AWGB and RPT and their programmes. Let common sense play a part and see youngsters enjoy woodturning without getting mired in red tape. I dislike the 'would be masters' who come into woodturning from a different discipline with little or no trade background, adopt bad practices and know it all after a couple of years. 4. What direction to you see your work taking, or is this determined by your clients, predominantly? I've no plans to retire, but work is determined by my clients. I'd like to finish off some hollow forms I roughed out 7-8 years ago and do more experimental work. However, there's a lot of very interesting turned work in industry - it's not just spindle work. 5. If you could only offer one bit of advice to someone starting out turning, what would it be and why? Join a woodturning club, seek out a potential tutor, ask about their qualifications and experience, if any, and then have some lessons. If you're put on the right track early and taught the correct use of tools and equipment, you'll find the whole woodturning experience more enjoyable. 6. What music and which book are currently into? I enjoy all types of music, but mostly rock: Pink Floyd, Bob Seger, Queen and Bruce Springsteen. I love browsing technical books on the wood and metal trades. I am currently reading A Race for Madmen, a history of the Tour de France. I raced as an amateur cyclist, hence the interest. I'm just finishing a four-poster bed in oak (Quercus robur), with a 4ft length of two start barley twists on each leg, machine cut - I can carve by hand but this is business - then hand carving the lead in and out to blend with the other turning. 8. Was the 12ft architectural column you turned a challenging commission? Three years ago, I did a large segment construction shell turning, 2ft in diameter and 4ft 6in long, made from tulipwood (Liriodendron tulipifera). It was split in half in length with a turned tongue and groove joint to locate the two halves together. This 'shell' was to house and display a company's filter system for the oil industry at a conference in New York. I cut away a quarter section on one half to display their product. A very satisfying project. 9. Which turners do you most admire and why? No one in particular. 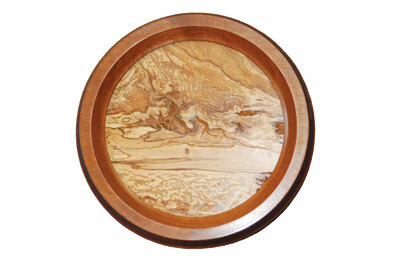 Worldwide there are many very good woodturners. Anyone who explores new ideas and processes - as long as they are safe - and gives guidance and shares knowledge with newcomers. 10. What are your other interests besides turning? Keeping fit, cycling, walking and writing poetry. I studied massage for two years and qualified some years ago. Another passion is restoring 'classic' older English woodworking machinery. With the lack of skilled tradesmen in this country, more of the same, with more sculptural pieces incorporating turning and carving, adapting knowledge I've learnt from 46 years in industry. I'd like to become more involved in teaching if red tape doesn't impede me. The absence of woodturning in schools. Is this because there aren't many skilled woodturning teachers or is it the fear for schools being sued? I can only speak for the UK. 13. What would you say is your biggest regret? While living in Australia 30 years ago, I turned down a three-year course at a hospital, to learn the making of artificial limbs for injured people. I often wonder which path my life would have taken had I taken it, and how many people I would have helped along the way as a result of exploring this career.